The ‘RuPaul’s Drag Race’ guest judge sashayed into queer hearts years ago. Sunday evening’s Grammys telecast was a pretty queer one. Not only did several queer women rock the stage and take home awards, country singer Kacey Musgraves was the queen of the night. She performed her certified queer ballad “Rainbow” from her album Golden Hour, which ended up winning album of the year, the night’s top prize. 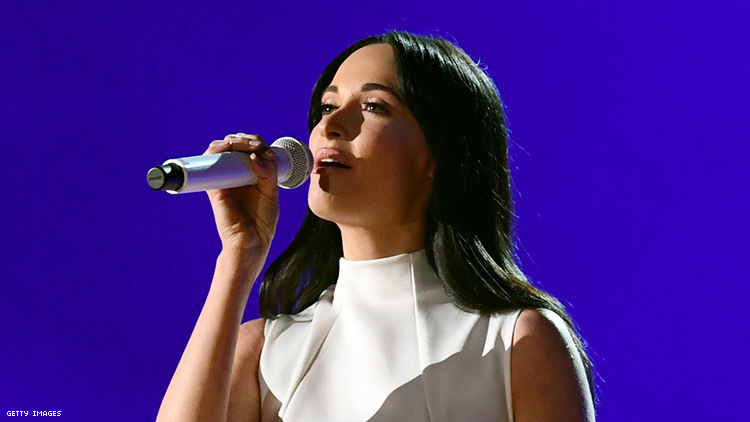 Musgraves also joined Katy Perry, Miley Cyrus, and others to pay tribute to iconic country singer and gay icon Dolly Parton. Musgraves and Parton have much more in common than their country roots. Much like Parton, Musgraves is also a vocal LGBTQ+ ally in the country music community. Musgraves’ first album, Same Trailer, Different Park, released in 2013, featured the song “Follow Your Arrow,” which called for LGBTQ+ acceptance and ended up raising conservative ire. The song features lyrics like, "Make lots of noise, kiss lots of boys / Or kiss lots of girls, if that's something that you're into" and prompted Colorado pastor Kevin Swanson to say that the singer “would not have made it out of town” if she performed that song in a bar in the 1920s in Denver, Colorado. “Somebody would’ve called for a rope,” he said. Musgraves ended up performing the song at the 2014 GLAAD Media Awards. The singer told Billboard writing the song was “redeeming” for her, as she felt guilt for once shunning gay people. She said that, growing up in a small-town high school, if she “[saw] a gay guy get made fun of, I’d like, laugh along and not really think much about it.” She later said that when a best friend came out to her, her perspective “completely changed” and when she moved to Nashville, she began to hang out at a gay club and make gay friends. “What I think it is — someone told me this recently and it broke my heart — they said, 'I’ve grown up loving country music and I grew up gay in a small town, and country music has always felt like a big party that I wasn’t invited to.' Oh my god, you’re invited to my party. While she recognizes that she has a gay fanbase, she also hopes that one day country music can produce an actually gay star to sing of what it means to be queer with life experience. “I keep dreaming of the day when we have a gay country music icon, that is loud and proud and really, like, a hero for country music fans, especially in these small towns where [LGBTQ+ people] are terrified of being themselves and feel like they have to hide,” Musgraves told the Huffington Post in 2018. As the Post pointed out, while country singers like Chely Wright and Ty Herndon have come out, they did so a long time after their height of fame. Musgraves is also a huge fan of drag culture. When her second album Pageant Material dropped in 2015, she hosted a drag queen show at Nashville’s gay club Play where queens lip synced to some of the songs from the album. In December 2018, Musgraves — who, like Parton, said that she feels as if she is a drag queen — appeared as a guest judge on RuPaul’s Drag Race All Stars. She sashayed down the runway in a denim-and-diamonds inspired look, complete with a very long hairpiece and whip. Musgraves’ ally bona fides are so well-known that when she took a gig performing at 2019’s Coachella, she received blowback, given that the owner, Philip Anschultz, of the festival’s parent company has donated to several anti-LGBTQ+ causes. When asked about her appearance at the annual flower crown festival, Musgraves spoke about the importance of her voice being there, especially in a festival that still has trouble representing women. Musgraves followed up her album of the year win by releasing a video for her song, “Rainbow,” which she performed in stage against a rainbow-lit background. In one of the video’s sequences, a young boy is seen putting on makeup and, a few moments later, his parents argue about him at the dinner table. As the argument rages on, Musgraves sings that there’s “always been a rainbow over your head.” No wonder the song has been adopted as a gay anthem since its debut. So, if you’re looking for a guilt-free way to spend a golden hour — er, 45 minutes — check out budding LGBTQ+ icon Musgraves’ now Grammy-winning album Golden Hour.